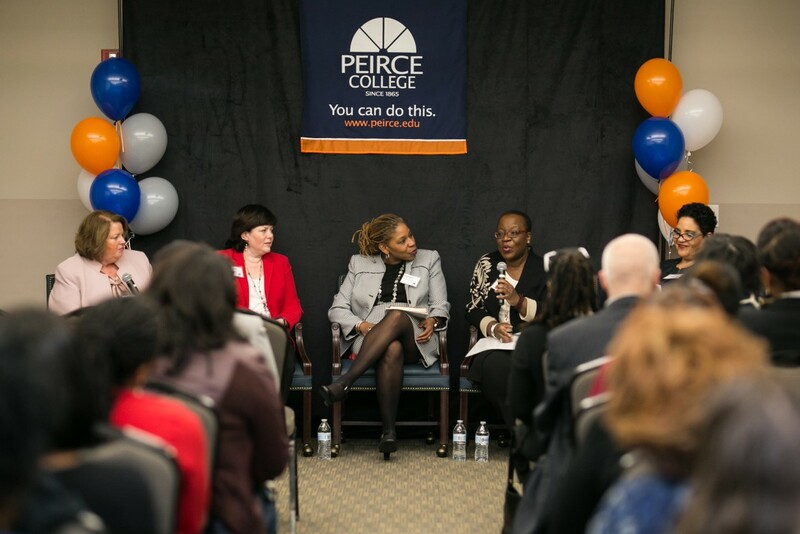 Last week, we were honored to be joined by some of Philadelphia’s top executive women who led the conversation on Advancing the Work of Inclusion and Equity at Peirce College’s 8th Annual Women in Leadership. In addition to these fine leaders, we were joined by approximately 100 community members who were actively engaged in the evening filled with candid and courageous conversations. Additionally, we had our special guest moderator, Carol Wilson Pandza, Senior Vice President and Chief Human Resources Officer, AmeriHealth Caritas. In addition, Dr. Monique Howard continued the discussion by encouraging the audiences’ hearts when she said, “Sometimes you are not invited to the table, but you know the table is for you. 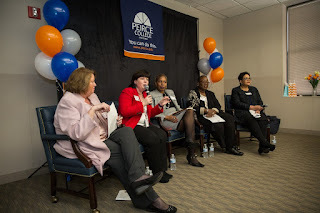 Take YOUR seat!” The panelists challenged the audience to not only push themselves to find growth and opportunity in the workforce, but to bring other women and other minority groups who may not have found this door for advancement yet with them. While on the topic of minority groups, the elite panel opened up about the importance of seeking diversity in the workforce through experience, background, race, gender, etc. Chellie Cameron and Sade Olanipekun-Lewis spoke directly to a work experience where Chellie developed a diverse leadership team, which Sade took part in, where she was able to bring together ideas and contributions from some of the most diverse workers. This dream team was not easy to form, but the results were tremendous and changed the organization for the better. On the topic of moving forward, Dr. Howard referenced the “Me Too” movement and how in order for all of us to finally see and experience real change, we need to continue keep pushing forward. Our efforts as a unifying group will allow for real change. As a closing point, Sade Olanipekun-Lewis brought everything together when she emphasized, “Our collective job is to help all of us achieve our higher purpose.” This idea tied everything discussed together showing how we won’t make progress without one another; we won’t see results without coming together as a team. The entire panel brought this form of togetherness to the room on Thursday, March 29 and we hope despite the event concluding, the conversation does not end. Thank you to all of our panelists, our special guest moderator and all of our community members who joined in on this timely and necessary conversation! Be sure to stay tuned for more Peirce events coming up where we continue the discussion on advancement with inclusion and equity.